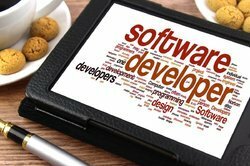 Prominent & Leading Manufacturer from Chennai, we offer software developers. Gharuda Infotech Private Limited provides Software Developers services with highly experienced in Database development, Software development, Programming analysis, and design through its concentration in a range of programming languages. This program gives the complete information about Software Development and Design. We also develop complete Billing and Stock Summary software as per our Client’s Requirements. Furthermore, this service is quality assured as our quality inspection team also keep the higher standards maintained at every stage.